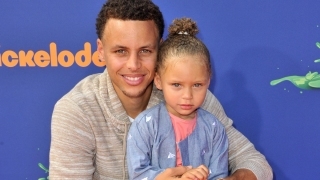 File image of Steph and Riley Curry. Riley Curry has a new crib. Well, more like a 120-square-foot interior playhouse decked out with outside swings, a tubular slide, rock climbing wall and plenty more amenities to keep her busy. Treated by Audy and Tyson Leavitt from TLC's new show "Playhouse Masters," the daughter of Golden State Warrior point guard Steph Curry was left speechless when her new play place was unveiled, according to the the Playhouse Masters' video, "The Curry Family's Pony Playhouse." But, after all of her new luxuries sunk in, she was ecstatic to be surrounded by a 15-foot-high tower, ball pit, princess costumes and even a mini-house for Riza, the Curry's black labradoodle. "I love it! I love it!" Riley said after familiarizing herself with her humble abode on family's Walnut Creek property, she was heard saying on the video. Not to be left out, baby sister Ryan will also get to enjoy some time in the elaborate play structure. Whether Riley likes it or not, two "R" letters were painted prominently above the main entrance.